In an audacious technological mission, India is building a near foolproof database of personal biometric identities for nearly a billion people, something that has never been attempted anywhere in the world. Poorer Indians who have no proof to offer of their existence will leapfrog into a national online system, another global first, where their identities can be validated anytime anywhere in a few seconds. 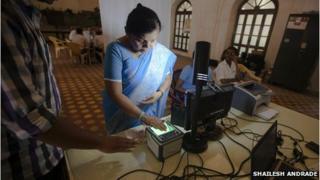 "India will outdo the world's biggest biometric databases including those of the Federal Bureau of Investigation and the US-VISIT visa programme," says Nandan Nilekani, the technology tycoon who heads the programme popularly called by its acronym UIDAI. The United States' visa programme is a biometric database of 120 million. In comparison, the UIDAI has already registered 200 million members, less than two years after the first enrolment. By 2014 half of India's population will have an identity tagged to a random, unique 12-digit number. As more and more Indians have their fingerprints taken, irises scanned and photographs clicked, UIDAI's chief technology architect Pramod Varma describes the database structure as a "Google-meets-Facebook" scale out. With its internet-class open source backbone, the database will accommodate more than 12 billion fingerprints, 2.4 billion iris scans and 1.2 billion photographs. Even more groundbreaking, once established and stored, a person's identity can easily be verified and authenticated using a cell phone, smart phone, tablet or any other device hooked to the internet. The information is stored in a fortress-like data centre in Bangalore with a triple layer of security, and travels in highly encrypted packets. Many of the radical ideas for UIDAI's technology have come from the talent the project has drawn from the Indian diaspora - tech entrepreneurs like Bala Parthasarathy of HP-acquired photo service, Snapfish and Silicon Valley returnees like Srikanth Nadhamuni, formerly with Intel. Mr Nilekani himself co-founded and built the multi-billion dollar outsourcing company Infosys before being drafted by the government to head the project. The programme has studied global best practices in biometric identity databases. Unlike the United States' social security number, which is guessable and China's, which adds the date of birth, India's 12-digit identity number is randomly generated. The United States' visa database does not factor in iris scans while India has included them to provide a greater degree of accuracy. India's telecom revolution leapfrogged over several stages of technology in the past decade-and-a-half to great success. Similarly, the massive UIDAI will vault over older technologies. "By starting on a clean slate and reconfiguring the structure, we have opened up a whole new set of possibilities," says Mr Nilekani. The project will stay abreast of the latest in biometrics, cloud computing and connectivity. Costs though have been kept low, first, by adopting an open policy in selecting devices and software and encouraging multiple private vendors. Second, the project is technology-neutral, not locking in to any particular hardware or software. If the technology architecture is unique, so is its accuracy in validating identities. "The combination of 10-finger biometrics, two-iris scans and photograph establishes the identity of a person with over 99.5% accuracy," says Krishnakumar Natarajan, CEO of Bangalore-based tech outsourcing firm MindTree, which is one of the firms building applications for the project. The best of the biometric databases in the world have a single de-duplication check, to ensure that every person is identified and tagged only once. UIDAI will de-duplicate three times over, accuracy that is vital in a country which has had a massive population migration in the past decade and welfare programmes that now total $60bn in value, says Ashok Dalwai, deputy director general of UIDAI. "A lack of identity has become the divide in India, denying needy Indians access to welfare programmes," Mr Dalwai says. In a country where billions of dollars in welfare get siphoned off by middlemen using fake identities, the programme will "stem leakage and fraud", he adds. The real challenge for the project, however, will be in the applications built around the unique identities. A slew of pilots are currently testing the robustness of the system. In a trial in Tumkur near Bangalore, Indians armed with a new unique identity number are opening bank accounts electronically. In the northern Jharkhand state, the government is electronically dispensing payments under an employment guarantee scheme directly into the recipients' bank accounts, which were opened after acquiring an identity number. Image caption The project is technology-neutral, not locking in to any particular hardware or software. In another pilot in the same region, people are authenticating themselves on a simple device connected to the network and withdrawing money from their new bank accounts. In the future, every outlet with such a device can potentially serve as a cash-dispensing "micro ATM". In the coming years, UIDAI holds the promise of being a game changer. With a unique identity, previously anonymous poor Indians can have access to services such as bank accounts, mobile connections and driving licences. That is already something, for a country which has a population of 1.2 billion but only 50 million passport-holders and 200 million with driving licenses. Indians design and build some of the world's most sophisticated software and technologies for multinational corporations. Now, some of this hi-tech savvy promise to transport India's neglected millions from the technological dark ages, propelling them from complete obscurity to an online identity. Saritha Rai is a journalist and commentator who tracks the economic, social and cultural changes sweeping India.